This is a zoom lens manufactured by Nikon and the model was launched 1999. 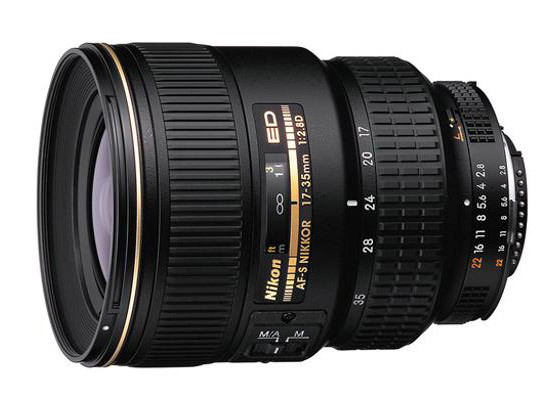 The lens has a focal length of 17-35 mm. Depending on which camera the lens is used, the experienced and perceived focal length will be different. Please visit the list of compatible cameras below, it will provide the equivalent focal length you get on each camera. A feature worth commenting, which is also related to lens brightness, is that the brightness and maximum aperture-value remains constant regardless of focal length used. This makes it easier for you as a photographer. No matter if you are have the focus ring and focal length at 17 mm or at 35 mm the aperture value can be f/2,8. If you buy this lens it will come with a lens hood, whose model name is "HB-23". Text from Nikon: "High-performance, ultra-wide-angle zoom lens, perfect for candid photography and news photojournalism in challenging lighting conditions. Extra-low Dispersion (ED) glass element reduces chromatic aberrations providing superior optical performance, even at maximum aperture. M/A switch for fast transitions from manual focus to auto focus. The standard lens for photojournalism and travel photography. Perfect for use with a film or a digital SLR camera. No power drain when manually focusing."